Adult apterae of Chaitophorus leucomelas are elongate oval in shape and vary from green to yellow. The dark dorsal markings are rather variable. 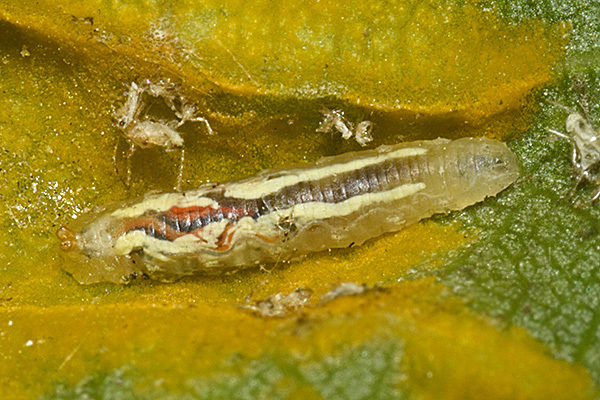 The adults usually have two dark stripes along the sides (sometimes divided segmentally) which tend to merge on the fifth abdominal tergites as can be seen in the first picture below. Alternatively the stripes may be missing. Whatever the pattern there are (nearly) always broad pale spinal and marginal areas. The antennae are half as long as the body of the aphid, with the terminal process of the sixth antennal segment 2.7-3.3 times the base of that segment. The short truncate siphunculi are dark at least apically. The cauda is rounded and very pale. The body length of an adult aptera of Chaitophorus leucomelas ranges from 1.2 to 2.4 mm. Chaitophorus leucomelas alates have dark brown dorsal abdominal cross-bands and separate marginal sclerites visible in the second image above. The host plant of Chaitophorus leucomelas in Europe is mainly black poplar (Populus nigra) and related species and hybrids, but in North America a wider range of species is colonised. They feed on young shoots of Populus spp. in spring, and later under leaves, in leaves stuck together by moth larvae, or in leaf galls vacated by other insects. It is commonly ant-attended. Chaitophorus leucomelas is widely distributed in Europe, North Africa and Asia, and has been introduced to South Africa and North and South America. The overwintering eggs of Chaitophorus leucomelas hatch in spring and the fundatrices develop on the young leaves. The development rate of this species on black poplar was studied under laboratory conditions by Hintze-Podufal & Thorns (1978). The development rate almost doubled when the temperature was increased from 15 °C to 25 °C. However, the number of progeny at 25 °C was reduced, and the death rate at the higher temperature was greater especially during the first larval stages. The lower life expectancy and lower fecundity at 25 °C were compensated for by the more rapid development at that temperature. No studies appear to have been carried out to assess the nutritional benefits (or otherwise) of feeding on tissue galled by other insects. It seems likely that availability of soluble nitrogen will be higher in galled leaves, which would be advantageous to Chaitophorus leucomelas enabling it to continue to feed and reproduce in mid-summer when no further young leaves are available. Oviparae (see picture below) and males are produced in October, and eggs are laid on poplar twigs. Chaitophorus leucomelas has unusually variable dorsal markings. The picture below shows part of a colony of this species including three adult apterae. Their colour ranges from very dark to pale. The dark aptera on the right has the typical markings of Chaitophorus leucomelas with two dark stripes along the sides which merge on the fifth abdominal tergite. The central, virtually all dark, aptera is unusual - Blackman & Eastop (1994) use the characteristic of 'broad pale spinal and marginal areas' in his key, but this would not work on this specimen. The paler aptera on the left would correctly key out to Chaitophorus leucomelas given it has dark siphunculi. All specimens have a noticeably very pale, almost white, cauda. Coeur d'acier et al. (2014) notes that Chaitophorus leucomelas has exceptionally high intraspecific divergences. It is a species with a large geographic distribution that presents different numbers of chromosomes according to its origin. This suggests that there may be sibling species within this taxon. Insect response to plant surface features is a critical step in host-finding and acceptance of herbivorous insects. The plant surface is usually covered with epicuticular waxes. which are not only involved in water physiology, but also provide resistance to insects. Alfaro-Tapia et al. (2007) looked at the probing behaviour and performance of the aphid Chaitophorus leucomelas on dewaxed and waxed leaves of two poplar hybrids. 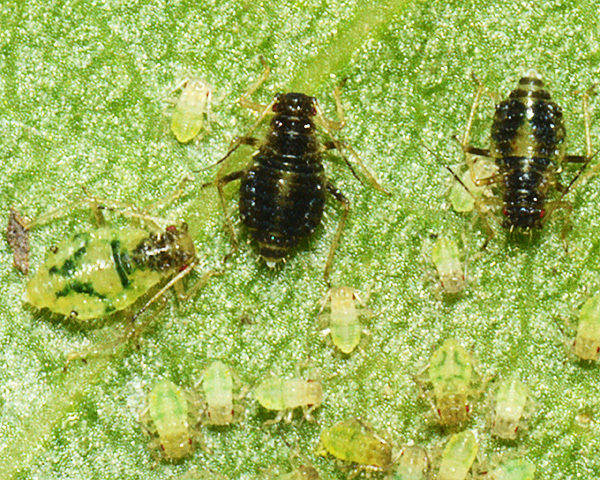 Laboratory experiments showed that in naturally waxed leaves of the resistant hybrids, aphids devoted less time to probing and more time to non-probing behaviour when compared with their behaviour on susceptible hybrids. These differences were not present when leaves of these hybrids were experimentally dewaxed. A field experiment demonstrated that aphid reproductive performance was affected by hybrid genotype, but not by epicuticular waxes, although a trend of lower performance on dewaxed leaves in both hybrids was apparent. Barrios-San Martin et al. (2014) investigated host selection and probing behaviour of the poplar aphid testing the hypothesis that poplar resistance to this aphid is associated with the presence of volatiles and secondary plant compounds. Studies on two poplar hybrids with contrasting susceptibilities suggested the involvement of antifeedant factors in the less favoured hybrid as well as a higher abundance of monoterpenes, sesquiterpenes, alkanes and phenols. Chaitophorus leucomelas is unusual in that it tends to live inside the galls of other insects, indeed often the galls of other aphids. 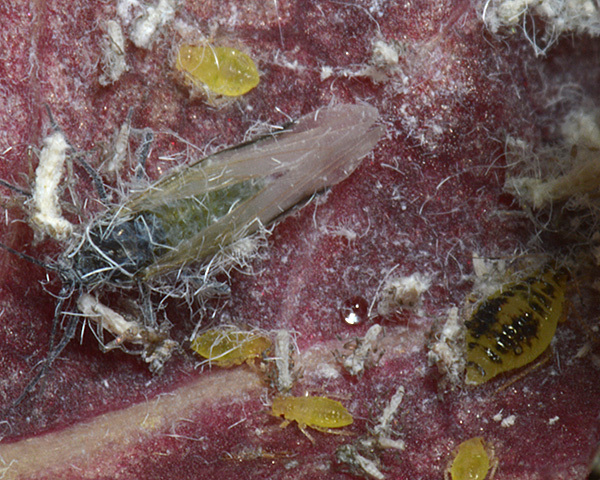 The images above and below show Chaitophorus leucomelas inside a gall induced on black poplar by Thecabius affinis (Poplar-buttercup gall aphid). In the case above, Chaitophorus is likely to benefit from the association both from the protection from predators and parasitoids provided by the gall plus wax, and nutritionally through the 'sink effect'. In the case below, Chaitophorus leucomelas were selectively feeding on a bacterial gall caused by Taphrina populina. There is no wax and little protective covering - the gall is completely open on the underside of the leaf. Hence the only benefit to Chaitophorus is any increase in soluble nitogen resulting from the bacterial gall. 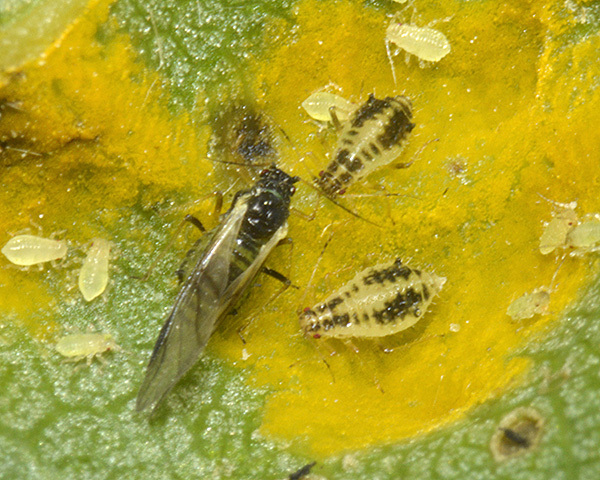 Chaitophorus leucomelas is sometimes attended by ants which feed on the copius amounts of honeydew excreted by the aphids (see picture below). Within the genus Chaitophorus, Shingleton et al. (2005) looked at how a morphological trait - the length of the mouthparts - may have promoted the evolution of ant-aphid mutualisms. Considering thirteen species of Chaitophorus, they suggested there was an evolutionary relationship between feeding position, dimensions of the mouthparts, ability to escape, and the risk of predation suffered by an aphid species. Aphid mouthpart length varied with feeding position with petiole-feeding species having longer mouthparts than leaf-feeding species. 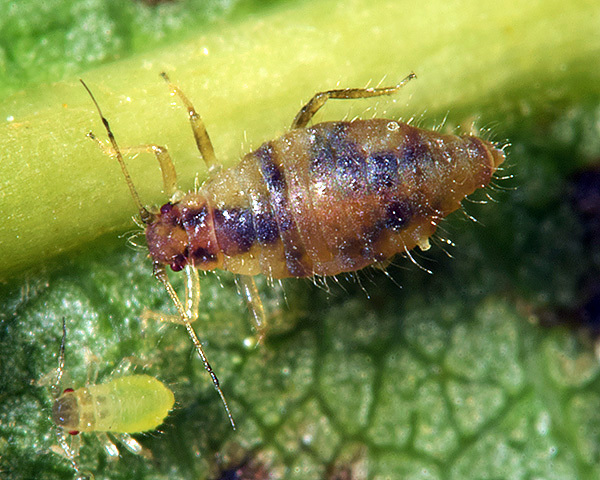 Differences in mouthpart length influenced an aphid's ability to escape from predators. There was a significant positive relationship between the mean length of a species' mouthparts, and the mean time for that species to escape. 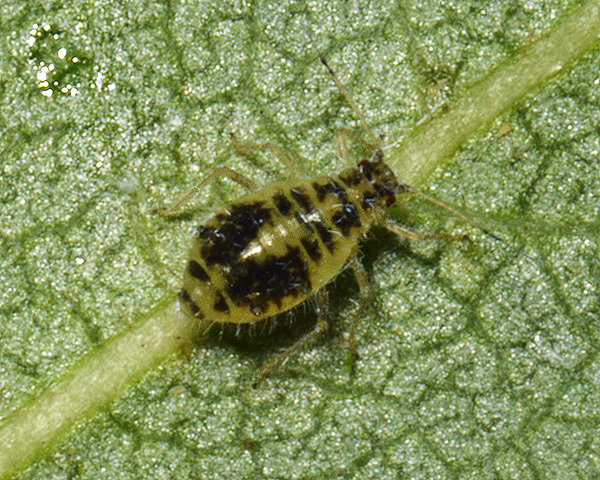 Differences in escape ability influence an aphid's susceptibility to predation. There was a positive relationship between mean mouthpart length for a species and the level of predation it suffered. Given these findings, they then used the data to test whether there was a relationship between mouthpart dimension and ant tending. 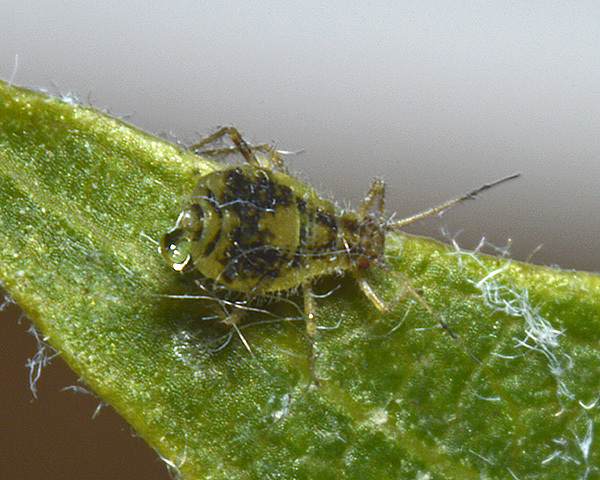 Amongst the Chaitophorus aphids, tended aphids (obligate and facultative) had longer mouthparts than untended aphids . The mouthpart length of Chaitophorus leucomelas is about 0.30 mm, midway in Shingleton's mouthpart length distribution of Chaitophorus species, and similar to other leaf feeders either facultatively ant tended (Chaitophorus populialbae) or untended (Chaitophorus salijaponicus niger). Both Shingleton et al. (2005) and Blackman & Eastop (1994) class Chaitophorus leucomelas as an obligate myrmecophile. Our own observations cast doubt on this because they do not seem to be attended when living in galls, whether induced by Taphrina or by Thecabius affinis. We would instead class this species as a facultative myrmecophile. When the aphids are not attended, we have observed predatory syrphid larvae preying on the colonies (see picture below). Tomanovic et al. (2009) describes a new species of braconid, Areopraon chaitophori, associated with Chaitophorus leucomelas on Populus. Of those aphid species, Baker (2015) lists 17 as occurring in Britain: Aulacorthum solani, Chaitophorus leucomelas, Chaitophorus populeti, Chaitophorus populialbae, Pemphigus bursarius, Pemphigus gairi, Pemphigus phenax, Pemphigus populi, Pemphigus populinigrae, Pemphigus protospirae, Pemphigus spyrothecae, Phloeomyzus passerinii, Pterocomma populeum, Pterocomma tremulae, Stomaphis longirostris, Thecabius affinis, Thecabius lysimachiae, and Tuberolachnus salignus. 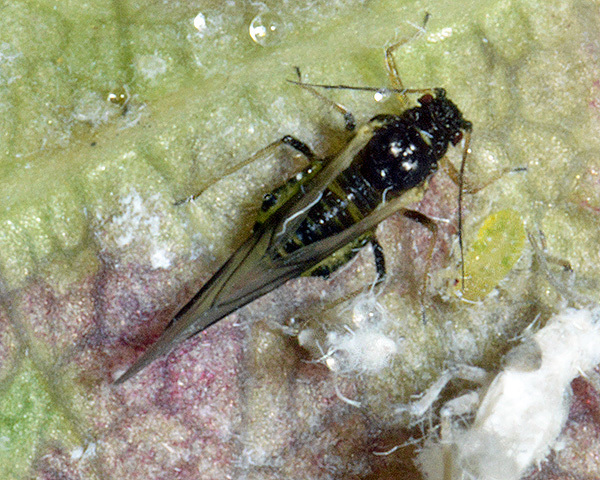 Most research on control of black poplar leaf aphid is focused on the use of plant resistance to minimise pest damage. 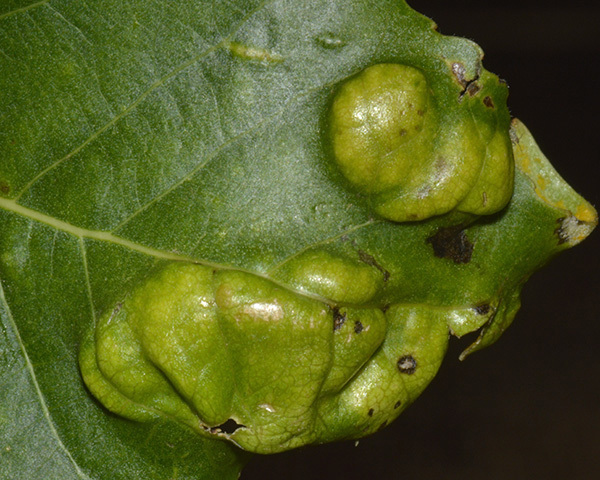 Chaitophorus leucomelas is one of the most important pests of poplar (Populus spp.) plantations in Iran. Yali et al. (2009) assessed reproduction, and life history of Chaitophorus leucomelas on 11 poplar clones belonging to three species, Populus nigra, Populus deltoides and Populus euramericana. They concluded that susceptibility is inherited through Populus deltoides, whereas resistance seems to be inherited through Populus maximowiczii. 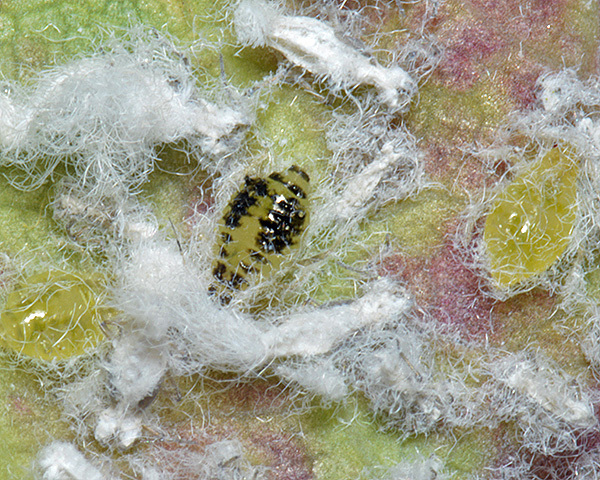 Thus, Populus maximowiczii hybrids are recommended for commercial or ornamental planting programs in zones where there is a high risk of aphid infestation. Ripka (1999) lists Chaitophorus leucomelas as one of the pests causing the biggest problems on ornamental trees and shrubs in Hungary.